Marseille gave Paris Saint-Germain a longer fight for the title than expected in the spring. 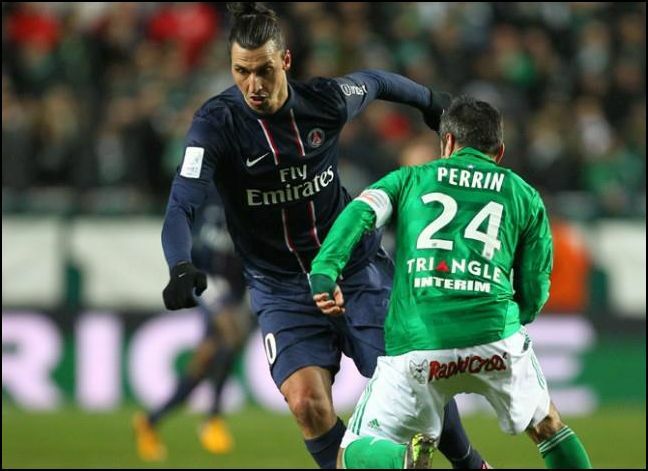 But on Sunday evening shook PSG players off the last doubts and defeated Lyon away from home, 1-0. With two rounds remaining the league title, the third so far, is back in Paris after 19 years of waiting. – This title is a good start for the club, the future belongs to us, said Zlatan Ibrahimovic. Zlatan Ibrahimovic has made 27 of PSG’s 63 goals so far in the league. Zlatan Ibrahimovic was also the team’s clearly most important player, could have been a two-goal marksman after a few minutes. But double scoring opportunities gave zero goals. Third placed Lyon instead put up a good resistance and not until after 53 minutes could Jérémy Ménez score a goal against Lyon. Zlatan Ibrahimovic won the ball in the middle of the field and played the ball to Thiago Motta who found Ménez left of the penalty area. A low end, it was necessary to make 1-0. – Today it’s official and we are very excited. Fans have waited a long time and finally they are masters like us. That’s why I came here, to become champion, said Zlatan Ibrahimovic. When the team celebrated in the locker room Zlatan Ibrahimovic got angry on the sporting director Leonardo for a moment and yelled “you always ruin everything.” The reason was that Zlatan was summoned to a doping check while his teammates celebrated the victory. – It was a doping check! Everyone was celebrating and I was stuck there for twenty minutes. No one came and picked me up. It is stupid – I wanted to celebrate. I’ve been waiting for nine months and now it is happening. It’s crazy, said Zlatan Ibrahimovic. For Zlatan Ibrahimovic, who may be elected player of the year in France next week, Sunday’s league title was just one of many during his careers as an European Professional. Besides two seasons – last year with Milan and the second year in Ajax – he has won the league every year for every club he played. A total of ten titles in twelve years with six different teams. He won eight titles in a row before the suite was broken last year. – But now I’m back on track, Zlatan Ibrahimovic said. With the league title secured, PSG management now put full focus on the future. During the spring, perhaps the two most important pieces of the puzzle, Zlatan Ibrahimovic and coach Carlo Ancelotti, are rumored to be moving away from the club. To succeed in retaining one or both would be a show of strength in the pursuit of PSG’s actual future: A Champions League title. – He has met PSG and their projects revolve around him. I do not think he will leave Paris, said Mino Raiola told Sky Italy on Sunday evening. – I have two years left and I’m professional and rescpect my contract. If nothing happens I will remain here, of course. Zlatan also commented the moving rumors surrounding Ancelotti. – I hope he stays. He has done a fantastic job here and he’s a good coach. He gives me the peace kag needs and team needs, said Ibrahimovic. – It feels great. Long time since Paris wing something, 17, 18 years ago last? It is always great to win the first time. If Paris had won last year it might have been normal this time for the club. But I am here and I am at the beginning of this club and its future. It could not be better, says Zlatan Ibrahimovic. – There has not been an easy season for anyone, we must not forget that the person on the staff, Nick (the club’s nutritionist), died. It was a tough period for the team, not least mentaly as he was close to us. I want to dedicate this victory to him. Carlo Ancelotti was his usual after the victory, but when Nick Broad came up the PSG’s coach was visibly moved. – I do not want to talk about Nick. How Zlatan Ibrahimovic would celebrate the victory he would not want to comment on. – That you need not have to worry about, said Zlatan Ibrahimovic with a smile. This entry was posted in Uncategorized and tagged psg champions, psg ibrahimovic, psg title, psg win, psg zlatan on May 14, 2013 by Johan Bengtsson.